UCU held a day of action on 6 March 2013 protesting against the over-use of casual contracts in UK further and higher education. To follow on from this Day of Action a training/organising conference will be held on Saturday 4 May 2013 to look at how we strengthen our ability to secure improvements for members on casualised contracts. Members on casualised contracts themselves, newer members and those that have not previously been active are particularly welcome to attend. Please click here for more details. Events and activities took place in universities and colleges across the country on UCU's National Anti-Casualisation Day of Action on 6 March 2013. These are just a few examples but why not contact your local branch and find out what's happening in your workplace? Halesowen College branch used the campaign pack to publicise the issue. to campaign in support of negotiating improvements. Campaign packs are available to download below and packs can be requested by e-mailing:anticasualisation@ucu.org.uk. 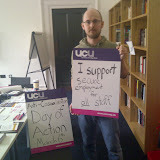 The day of action is part of UCU's Stamp Out Casual Contracts campaign.